← stained glass Easter cookies – gluten free, of course! TIP: We finally found Cup 4 Cup here in Red Deer at Save On Foods but if you can’t get it where you are, check out this copycat recipe here. TIP: My grandmother’s recipe for the filling was not exactly scientific: “Cook apples and sugar until it makes a sauce. Add vanilla and cinnamon” 🙁 So for this one we used most of a can of apple pie filling and added ¼ teaspoon cinnamon and 1/8 teaspoon nutmeg. It worked great. In a medium sized bowl, dissolve sugar in water and add yeast to activate it. In a small bowl, mix the egg yolks and the sour cream. In your food processor, add flours and salt (and xanthan gum if needed. Cup 4 cup has it included, but if you use a flour mix that doesn’t be sure to add a teaspoon of it) and pulse to combine. Cut the hard margarine or butter (we used margarine in this recipe) into cubes and sprinkle them on top of the flour. Pulse the mixture about 10 times until it is crumbly. TIP: If you don’t have a food processor, you can also do this by hand with a pastry blender. Now pour the liquid over the flour mixture and pulse (or blend by hand) just until the dough comes together. Remove the dough from the processor, shape into a ball on parchment, and knead it until it comes together nicely – about 6 or 7 times. Cover with another piece of parchment and roll out into a rectangle approximately 10 x 12 inches. Remove the top parchment and add filling by spooning a 4 inch strip of filling across the middle of the rectangle from 10 inch side to 10 inch side. Leave about 3 inches free of filling on the top and bottom and about 2 inches on the ends. Fold as you would an enchilada – ends up over the filling first and then the top and bottom over. If the top and bottom meet, you can seal the dough with water. If they don’t, don’t worry. The dough will open up to reveal the filling inside as it bakes. Beautiful! TIP: If you are particularly crafty, or brave, you can cut the 3 inch top and bottom pieces into strips with a sharp knife and fold them over each other to look like a braid. Move the pastry onto a parchment lined baking sheet. TIP: Use the parchment the pastry is sitting on and just move the entire thing over. Take some of the left over egg whites and beat lightly. Using a pastry brush, brush some of the whites over the top of the pastry and then sprinkle the entire kringle with white sugar. Bake for 35 – 40 minutes or until golden brown in colour. 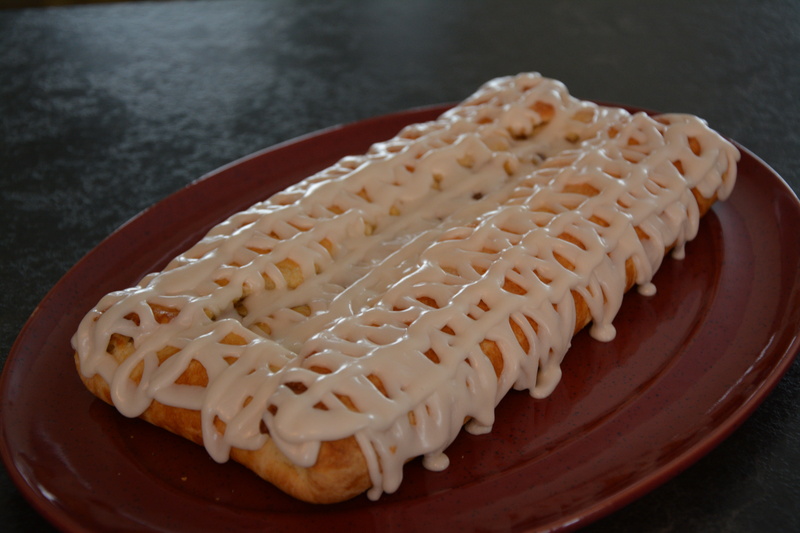 TIP: The glaze is what really makes this pastry sing. Don’t be tempted to skip it. Mix the icing sugar, margarine, extracts and 2 tablespoons of cream or milk together until they form an icing. Add more milk by the teaspoonful until you get the consistency you want. TIP: You can use straight vanilla if you don’t want the almond flavour. Geoff doesn’t care for it, but I love it. Once the pastry is cool, you can drizzle on the glaze using a spoon or pastry bag. Let the glaze harden and serve. Best eaten the first day. By day two it had hardened up a bit but still tasted great. 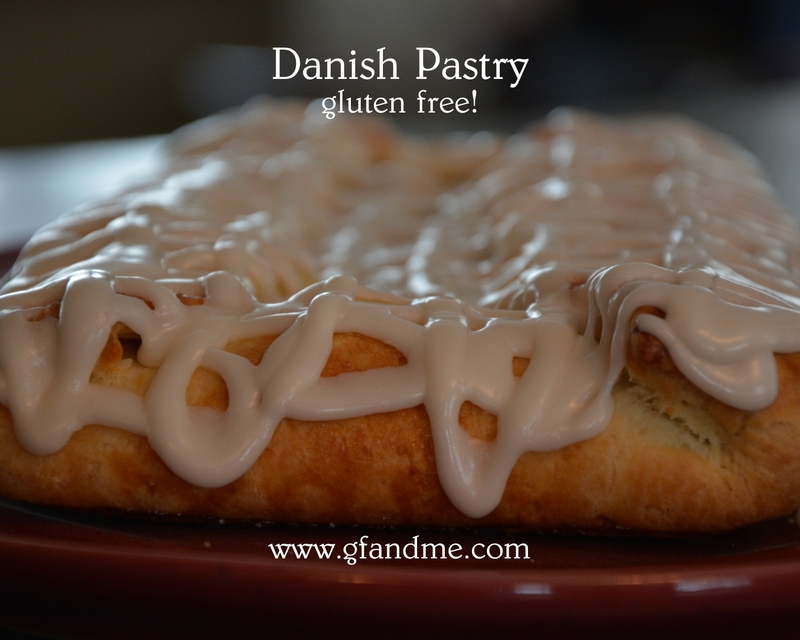 This entry was posted in Baking, Drinks & Desserts, Recipes and tagged celiac, coeliac, Cup for cup flour, Danish Birthday Cake, Danish pastry, Fodselsdag Kringle, GF, gluten free, gluten free in Red Deer, kringle, recipe. Bookmark the permalink. That looks so good. 🙂 Did you love cup4cup? I did love cup4cup. I haven’t experimented too much with it yet but I’m looking forward to trying new things. I see what you mean about it being expensive though! You’re so welcome. And she probably will! I served it at Easter dinner and it was a huge hit. Mind you, most of my guests were family and remembered and loved the original! This is one of my favorite pastry products and your version is a gem! Thank you! You’re welcome. Hope you enjoy it as much as we did! Oh wow! Never seen a GF Danish before! I’ve linked to this on my Facebook page, so I hope you get some traffic. It’s amaaaaazing! Nicely done. What a challenge, but you took it in stride. Thanks so much for the kind words. Of all the recipes on gfandme I think you’ve picked my favorite! Let me know what you think if you get a chance to make it.